The TKE Parents Club is made up of moms and dads of undergraduate and alumni members. Its mission is to support the fraternity and its members through programming that parents doespecially well. 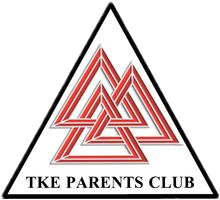 All TKE parents are considered members in this organization and encouraged to participate in any capacity their schedule will allow. The support of the Parents Club will provide additional tools and means to further enhance our son’s TKE experience and the continued growth of the Beta-Sigma Chapter. An active Parents Club will help to facilitate social and professional networking opportunities between parents and sons, and will provide a means for out of town parents to feel more connected to their son’s college and fraternity experience. Every fall, one of the home football games is designated as USC Trojan Family Weekend. The Parents Club typically holds a Friday night cocktail reception at the fraternity house and then joins their sons and alumni at the world-class TKETent Tailgate located just outside the Coliseum. TKE awards scholarships every year to members who excel is academics and fraternity involvement. The Parents Club helps coordinate this event often providing the finishing touches to the food and decorations. The TKE Parents Club organizes a Senior Dinner for graduating TKE Seniors and their families and friends to celebrate together, the night before Graduation from USC. At the dinner we recognize the accomplishments and relive the memories of the past years. It’s a great opportunity to enjoy this special time together and celebrate the bonds of friendship through Tau Kappa Epsilon.